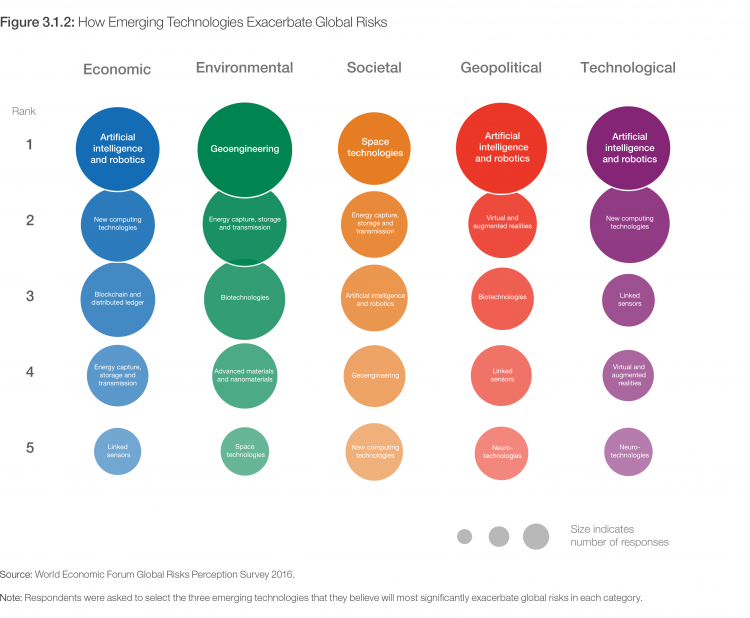 Every year, just before its annual meeting in Davos, the World Economic Forum puts together a “Risk report” — a compendium of what the world (or at least the bits of the world that the WEF asked) is worrying about. Watching the release of this year’s report I was struck by the fact that, for the first time, as far as I can tell, the report mentioned geoengineering. Unsurprisingly, I was intrigued. Geoengineering did not, though, rank anything like as high as AI or biotech, or even blockchain, when it came to the need for greater governance. The report does not tell us what to make of these findings . 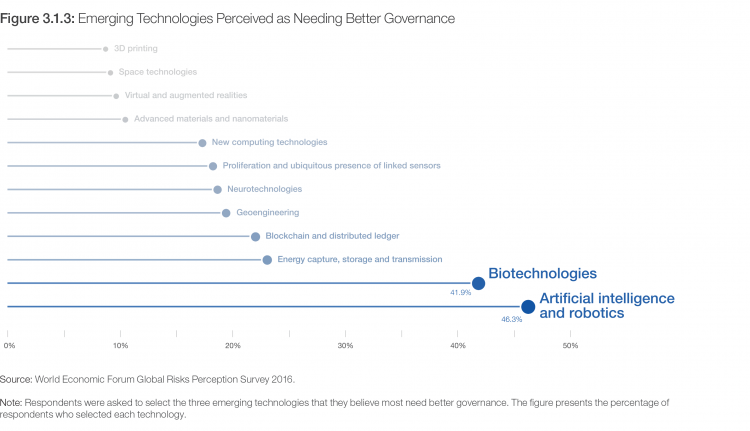 It does provide some general and sensible, if hardly groundbreaking, thoughts on the governance of emerging technologies: it is unlikely to get genies back into bottles; it needs to be able to respond to rapid change; its absence can lead to delay due to uncertainty; its early presence, if too heavy, can stifle things that might be safe and beneficial. In general it should be “stable, predictable and transparent … and should generate a sufficient level of trust and awareness among the general public to enable users to evaluate the significance of early reports of negative consequences.” That last point is particularly well taken. The report also claims that media attention to technology governance issues has increased greatly in the past few years. But geoengineering is one of a number of technologies which the survey asked questions about, but that the report doesn’t go into any further. The general discussion tends much more to AI — which gets a lot of special attention — autonomous cars, biotechnologies, distributed sensors and the like. This is particularly striking in that, in general, the survey and the report are very big on climate issues. 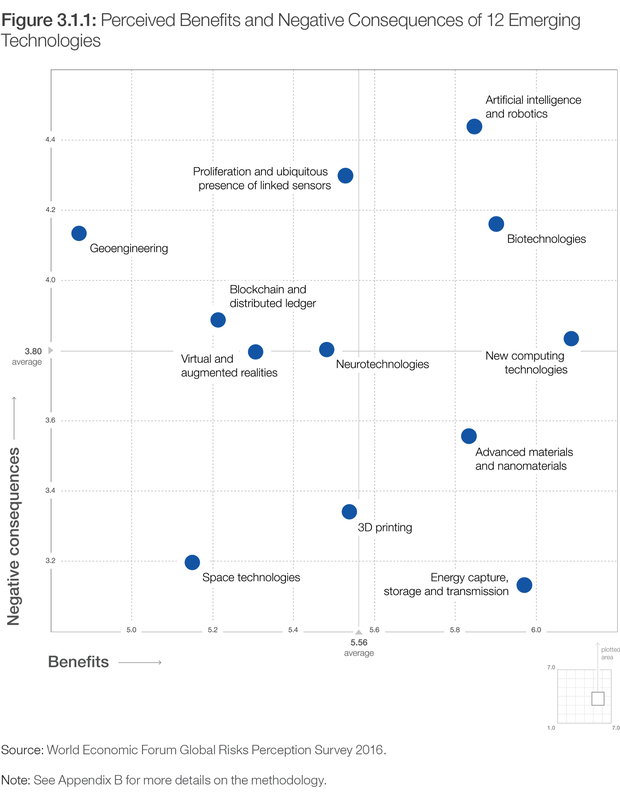 Note that among the emerging technologies, while geoengineering has the lowest net benefit, energy technologies have the highest. In the main body of the report climate change is one of the big five trends seen as dominating the risk landscape. There is significant discussion of the Paris agreement and what it means. Extreme weather events, natural disasters and large-scale involuntary migration are seen as the likeliest features in the “global risks landscape” (interestingly, for all three of these features the businesspeople responding to the survey rated the likely impacts lower than non-business responders did; but in general the business responders seem to be less concerned about most things). Only weapons of mass destruction come out above extreme weather events and water scarcity in terms of impact. So the relatively modest perceived benefit from geoengineering does not mean that the respondents aren’t worried about climate. It may mean that they are sceptical about the capacity of geoengineering to actually achieve much good. If so, one would have to explain their perception that it poses significant risks in terms of non-geophysical effects — ie, a belief that, though geoengineering might not be geophysically beefy enough to deliver very much benefit, it might still do a lot of harm, presumably though non-geophysical mechanisms such as leading to conflict or the breakdown of mitigation efforts. That’s not a bad reading — indeed I half agree with it, in that I think the non-geophysical risks would outweigh the geophysical ones, especially at low levels of deployment. But given the respondents’ lack of confidence in their assessments of these sorts of technology, it may be over analytic. More likely they just aren’t very sure it can do much good but think it sounds scary anyway. It would be interesting to see the WEF engage more on this, though there is no evidence that they will do so at this year’s Davos meeting. It might be a bit tricky for them; in general their model of technology is one that fits it into business practices and concerns, an approach that makes sense for things like IT and biotech, but not so much for geoengineering. But they have at least opened up some data on what people are thinking, and that’s a help in itself.